TNPSC Notification is out. TNPSC is recruiting for 46 Assistant Public Prosecutor Post Posts. 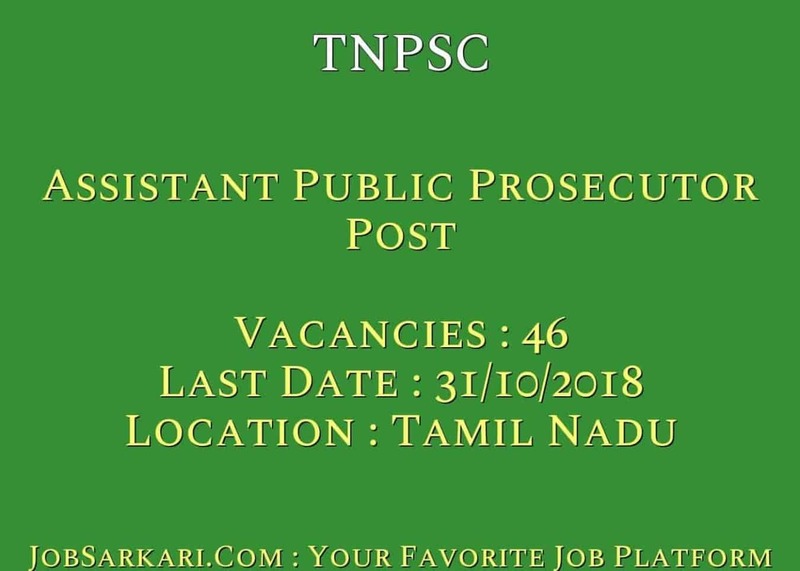 You can check TNPSC - Tamil Nadu Public Service Commission last date, download TNPSC notification, visit TNPSC official website and check other TNPSC Vacancy details.Complete Vacancy and recruitment Details about 46 Assistant Public Prosecutor Post vacancies in TNPSC are provided below by JobSarkari.Com only for you. Last Date for Apply Online 31/10/2018. Last date for payment of fee through Bank 02/11/2018. Date of Preliminary Examination 05/01/2019. Assistant Public Prosecutor Candidate Must Have Passed Bachelor Degree in Law and the Member of Bar Council With adequate knowledge of Tamil and Must have had active practice in ‘criminal courts’ for a period of not less than five years. 46. Destitute Widows of all castes. No Age Limit. Q. What is the Last Date For TNPSC Assistant Public Prosecutor Post Vacancy ? A. Last Date for TNPSC Assistant Public Prosecutor Post Posts is 31/10/2018. Q. What is the Form Type of TNPSC Assistant Public Prosecutor Post Recruitment ? A. The Form Type for TNPSC Assistant Public Prosecutor Post Posts is Online. Q. 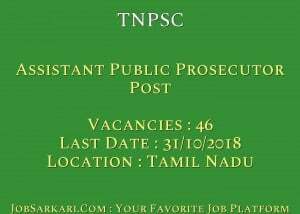 How many vacancies are available in Tamil Nadu Public Service Commission Assistant Public Prosecutor Post Posts ? A. There are about 50 Vacancies in Tamil Nadu Public Service Commission Assistant Public Prosecutor Post Posts.